“We condemn in the strongest terms possible, the attempted murder of a trade union leader in Cebu City and the violent dispersal of striking workers of food giant NutriAsia and their supporters, in Marilao, Bulacan," Atty. Sonny Matula, chairperson of Nagkaisa! said. “There was an apparent attempt on the life of Jessielou Cadungog, labor leader of ALU-TUCP, vice chairman of the Oriental Port and Allied Services Corporation (OPASCOR) and it involved the police," Matula said. 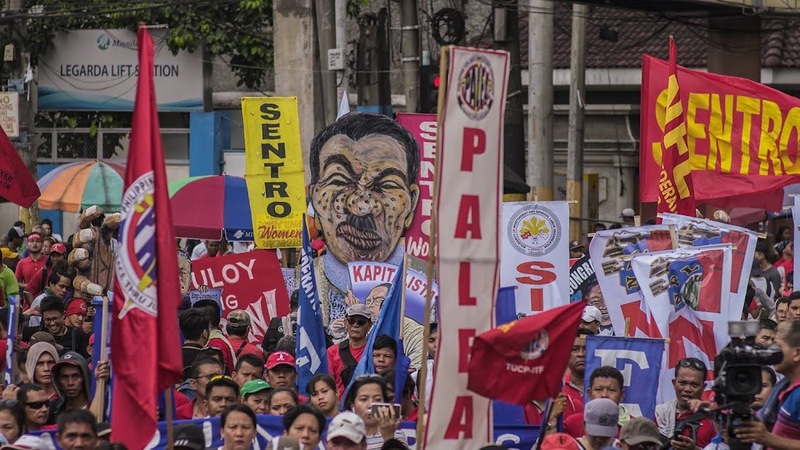 “A peaceful concerted action demanding the recognition of rights of workers such as what was being done by workers of NutriAsia, should never ever merit any and all kinds of violence, especially those perpetrated by the police and private security personnel," Matula said. Based on workers' accounts, some 100 security forces, including 30 police officers violently dispersed the picket line as protesters were holding a religious ecumenical service. Back in Cebu, the gunman who was killed in the encounter by Cadungog's aide was identified as PO2 Eugene Alcain Calumba. The accomplice who was taken into custody by the PNP was Michael Banua. “Now, the PNP is trying to portray the assassination attempt on Mr. Cadungog as a legitimate police operation identifying him as a 'person-of-interest' involved in shabu," Michael Mendoza, president of ALU-TUCP, a Nagkaisa member said. “We stand by Mr. Cadungog and condemn this sordid attempt to justify and cover-up for what is clear police involvement," said Mendoza. “It is becoming a sad refrain. The campaign against drugs is being used by the police as a flimsy excuse to either justify the use of violence or use it as an escape goat, when harassing workers and citizens who are exercising their legitimate trade union and human rights," Matula said. “We are calling on the authorities to conduct a thorough and objective investigation of the twin incidents of violence against workers that occurred yesterday. The police officers and their superiors who will be proven to have done wrongdoing should be made accountable. The culture of impunity must stop," Matula said.